After Attorney General William Barr released the summary of the special counsel’s report on Russian interference in the 2016 election, pro-Trump media, feeling vindicated, immediately launched into attacks on news organizations that credulously covered the developments over the past two-plus years. Right-wing media figures were angry, and many demanded apologies. Partisans within President Donald Trump’s inner circle took the narrative that Trump and American people were owed an apology and ran with it. During a March 25 appearance on CNN’s Cuomo Prime Time, Trump’s personal lawyer Rudy Giuliani went off on host Chris Cuomo, demanding apologies from CNN President Jeff Zucker, NBC, The New York Times, and The Washington Post. “You guys on this network have tortured this man for two years with collusion, and nobody has apologized for it,” Giuliani said. “Apologize for the overreaction to collusion,” he demanded. Jeff Zucker, head of CNN, are you going to apologize for your network's constant stream of lies and hysteria? Phil Griffin, NBC, are you going to apologize for the conspiracy theories you allow to be spread every second of every day on NBC? What about Jeff Bezos, Marty Baron, you going to come clean over the front page deception every day in The Washington Post? Will you at least stop referring to far-left, collusion-obsessed hack Jennifer Rubin and others as conservatives? They're not. Is The New York Times Executive Editor Dean Baquet, is he going to give back the paper's Pulitzer Prize for collusion reporting given they were caught now reporting a hoax? They all lied to we the people day after day for two-plus years. In reality, we know there will never be a mea culpa from any of these major fake news outlets. They’ll just move on to the next group of lies. They'll never apologize. They'll never retract their lies, their anonymous sourcing, their endless speculation. They are hopeless. Journalism, I told you in 2007, it's dead; it's buried. And it's not something that I said lightly. They have earned their horrible reputations. But credible reporting on the Mueller investigation should not be confused with the exaggerated claims of pundits and commentators -- a point lost in right-wing media's bad-faith calls for news outlets to “apologize” for their coverage. “Fake news” has real consequences, as reputable news organizations have demonstrated throughout the Trump investigation. Hannity’s blistering monologue included cutaways to clips from CNN and MSNBC shows, and shots of headlines from outlets such as The Washington Post, HuffPost, and Vox. A quick glance at the examples shown and it becomes clear that it’s opinion, commentary, and analysis that Hannity is taking issue with. He’s not alone, either. Davis’ examples of this “botched” story included unspecified issues with The New York Times and The Washington Post’s Pulitzer Prize-winning reporting, a Time magazine cover illustration, an opinion piece by New York magazine’s Jonathan Chait, and a Twitter thread from New York Times opinion columnist Paul Krugman. In the instances where Davis did correctly pinpoint factual errors, the news organizations that first reported them had issued corrections. Davis took issue with a CNN report about an email to the Trump campaign regarding WikiLeaks’ hacked documents, but he failed to note that CNN had very publicly corrected the story. He hit CNN for speculating on what former FBI Director James Comey would say in his testimony before Congress but ignored that CNN had issued a correction and updated its story. He pointed to a disputed 2016 Slate article about servers in Trump Tower but didn’t note the author’s follow-up reporting on the subject providing additional analysis. He lambasted a Washington Post report for saying that Russia penetrated the U.S. electric grid but missed that the paper’s correction stated that Russia actually hacked a Vermont utility company and the overhyped headline had been updated. Outside of Davis’ examples, other notable instances of flawed reporting included a June 2017 CNN story about Anthony Scaramucci’s possible ties to the Russian Direct Investment Fund and ABC correspondent Brian Ross’ incorrect report that former national security adviser Michael Flynn would testify that Trump instructed him to contact Russia during the 2016 campaign. CNN pulled its story and the three journalists involved in its publication resigned (including two-time Pulitzer Prize winner Eric Lichtblau, whom CNN had lured away from The New York Times months earlier). Similarly, ABC suspended Brian Ross over his report and unceremoniously parted ways with him months later, ending his 24-year run at the network. In short: At reputable news organizations, mistakes in reporting come with real consequences. This is all the more reason to ignore right-wing calls for some monolithic “media” to apologize. The nonspecific nature of these demands illustrates an important point -- just not one the people making those demands intended. It’s worth considering what role opinion journalism should play in our modern media ecosystem. Should the serious reporting conducted by reporters at a place like CNN be devalued because of an opinion expressed by a panelist during one of the network’s prime-time shows? And do viewers even know the difference? There’s a concerted effort to conflate fact and opinion, and it’s been going on for some time. Take, for example, the Republican National Committee’s publication of the results of Trump’s “Fake News Awards” in January 2018. The No. 1 item on the list was Paul Krugman’s prediction that a Trump presidency would be disastrous for the economy. No matter one’s opinion on Trump, the GOP, the economy, or Krugman himself, his prediction wasn’t “fake news” as predictions are, by their very nature, not hard news. Similarly, despite the rage directed at pollsters and analysts for not forecasting a Trump victory in 2016, their analysis was not “fake news” either. Pew found that just 26 percent of respondents were able to correctly label the five factual statements as such, and only 35 percent could correctly categorize the opinion statements. Somewhat worryingly, those least likely to be able to discern fact from opinion were also those with low trust in national news organizations, illustrating a vicious cycle of ignorance and distrust. While distinguishing fact from opinion might seem simple to some of us, it’s clearly a problem for many Americans, as groups like Pew and the American Press Institute have identified. In calling for broad apologies, Trump-aligned media are exploiting this point of ignorance. In truth, very little fact-based reporting on the Mueller investigation was demonstrably wrong. 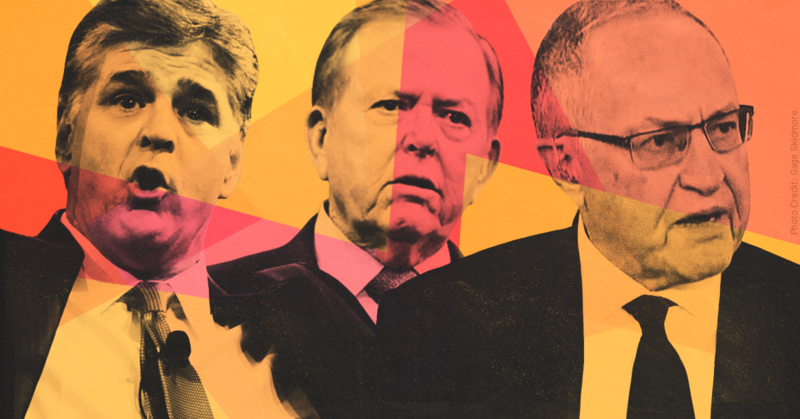 Hannity, Dobbs, Dershowitz, Davis, and the many others pushing the “apologize” narrative in right-wing media are banking on the pressure of their audiences’ outrage to make a dent in mainstream media credibility. In turn, this will force CNN, MSNBC, The New York Times, The Washington Post, and other news organizations that have been critical of the administration to take some sort of action in response. Instead of caving to demands to apologize and soften coverage, these groups should take a different approach altogether. In an age of unprecedented distrust of the press, news organizations can put an emphasis on educating their audiences and emphasizing reported work. In April 2018, The New York Times announced a change to the way opinion pieces would appear both online and in print. The changes included a new and distinctive typeface exclusive to the opinion section, increase in the size of the “opinion” header, and mini-bios for authors at the top of each article. “These product improvements are the first in a series of iterative changes to increase the clarity and impact of the presentation of Times Opinion to match the scope and ambition of its journalism,” read the paper’s announcement. When I appear on CNN, where I’m a paid commentator, there’s no sign that flashes above my head informing viewers that I’m offering opinions — and that there’s an important difference between me and the conservative commentators I’m on arguing with compared to the CNN reporters who come before or after us on a show and describe the facts of the news as it’s unfolding. This difference may seem obvious to some people. It’s not obvious to everyone. And that’s a problem. Every single time I go on television, I get a tweet or an email calling me “the most biased reporter on CNN” or something to that effect. In fact, I get a lot of these comments. Often. Which suggests that we’ve done a bad job of explaining to the public that there is a difference between news and opinion and who on their screen is there for which purpose. When I get these confused criticisms, I try to always write back explaining that it is my job to be biased. I’m a commentator. I am literally paid to express my point of view. Bias is basically the job description. The cable news equivalent of the Times making tweaks to fonts and formatting would be to clearly label guests and contributors in a way that informs viewers that the perspectives being shared are opinions. While it would almost certainly make for a clunkier broadcast, it could serve as a gentle nudge in the direction of educating viewers. Maybe the best thing for the reputation of news media overall would be fewer opinion segments, fewer panels, and fewer op-eds in general. Yes, it is a very tough industry, and yes, it’s controversial op-eds and on-air shouting matches that drive attention and revenue. Even so, that doesn’t necessarily mean that this model is good for the public’s overall understanding of what’s happening in the world. Perhaps the best response to bad-faith calls for apologies over justifiable coverage is simply to invest more in straight journalism.